Font weights can be far more than just bold and normal—most professionally designed typefaces are available in variants ranging from a thin hairline ultralight to a black extra-heavy bold. To make use of all those weights, we would need a separate file for each. While a design is unlikely to need every font-weight, a wider variety than bold and normal adds visual hierarchy and interest to a page. There’s more than various weights to consider. CSS3 introduced the font-stretch property, with values from ultra-condensed to ultra-expanded. Until now, these values only worked if you provided a separate file for each width. If you wanted every combination of weight and width in both normal and italic, you would need dozens of files. With variable fonts, we can get all this variety with a single file. The OpenType spec lists five standard axes of variation—all labeled by a four-character string. These are aspects of the typeface that we have control over. wght - Weight is controlled by the CSS font-weight property. The value can be anything from 1 to 999. This will allow for a more granular level of control. wdth - Width is controlled by the CSS font-stretch property. It can take a keyword or a percentage value. While it's long been possible to use a transform to scaleX or scaleY, that distorts the font in ugly ways unintended by the typographer. The width axis is defined by the font designer to expand or condense elegantly. slnt- Slant is controlled by setting the CSS font-style property set to oblique. It will default to a 20 degree slant but it can also accept a specified degree between -90deg and 90deg. Italic and Roman styles have (often radically) different construction principles, therefore point structures may not always be compatible. The browser can make any non-italic font emulate italics, but this is typographically ill-advised. Typographers can define named instances within their variable font. A named instance is a preset—a particular variation the font is capable of accessing with a name (e.g. "Extra Light") rather than with numbers alone. In the current CSS spec, however, there is no way to access these named instances. It's important to note that when you use a value like extra-condensed or semi-expanded for font-stretch, the value maps to a percentage predefined in the CSS spec—not to any named instance chosen by the font creator. 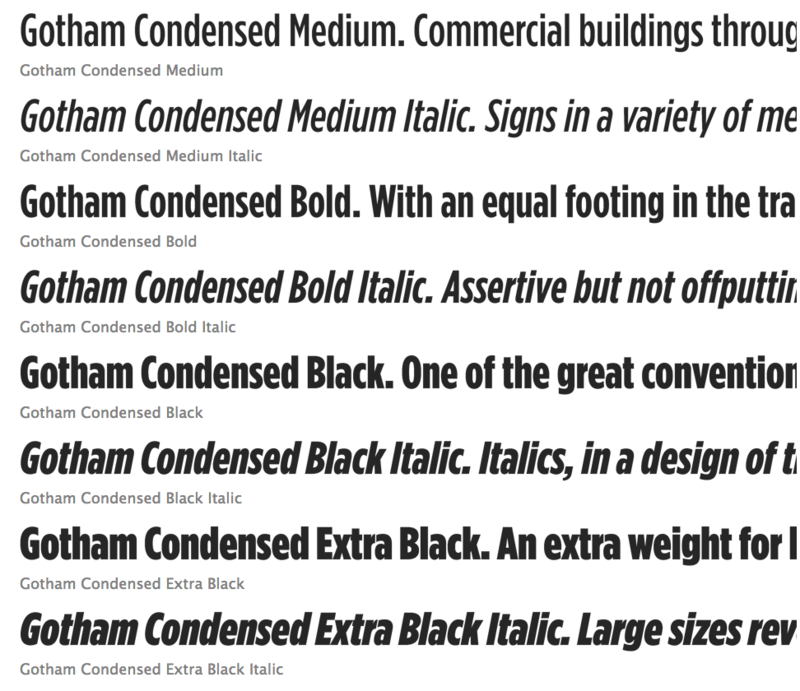 For font-weight, the bold value maps to 700 and normal to 400. As the spec puts it, "a font might internally provide its own mappings, but those mappings within the font are disregarded." font-variation-settings is not identical to the other variation-aware properties, because with these other properties, the browser has insight into the meaning of the variations, and can therefore do things like applying them to other font file formats, or creating synthesized versions if the font file doesn’t support the axis. Courtesy of David Jonathan Ross. 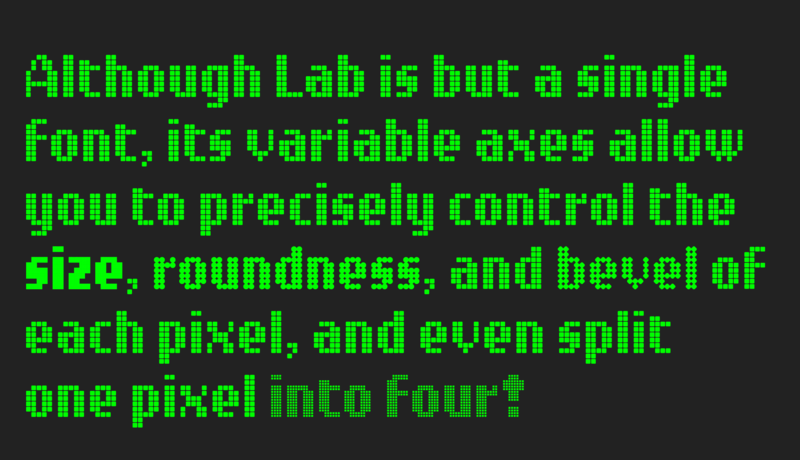 David is by the typographer of Lab DJR and already has several variable fonts to his name. These foundry-defined custom axes must use uppercase letters while the standardized axes always use lower case. With unique and unstandardized options, CSS authors must count on font developers to properly document their work. We’ve established that we’ll only need one HTTP request per typeface (or possibly two to separate Roman and Italic styles). Because they’re doing so much work, you might expect the file size of a variable font to be far larger than a typical font file. Let's have a (not entirely scientific) look. Variable fonts also mean that, for the first time, font-weight (and any other axis) can be animated. While adding type animation may sound like a superfluous embellishment a website can happily survive without, something like adding weight on focus, for example, seems like a natural and intuitive way to denote state to the user. In the past, switching from a normal to a bold weight was utterly jarring. With variable fonts it can be smooth and graceful. 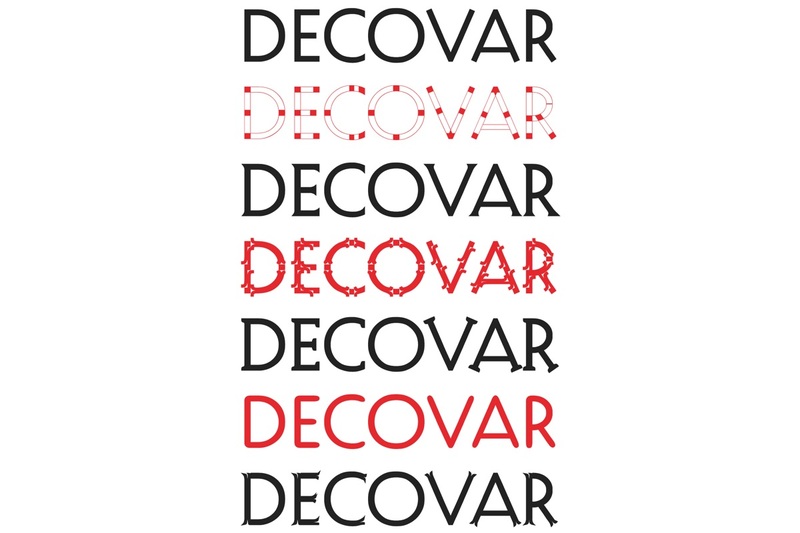 While Lab DJR and Decovar are excitingly creative, variable fonts aren’t all about avant-garde experimentalism. Optical sizing should bring a better reading experience to the web. Currently, type on the web is size agnostic; you can change the font-size and it will still look the same. Optical sizing means making size-specific optimizations for a typeface where the variation of a letter's form at different sizes can improve readability. We don’t want larger text to look inelegant or clunky, while smaller text benefits from the removal of fine details. More open counters, the thickening of subtle serifs, and an increase in x-height, width, weight and letter-spacing all improve legibility at smaller sizes. The initial value is auto so if you are using a font that makes use of an optical sizing index, you get the benefit for free out of the box. This technology is quickly making its way into browsers. Making use of it requires you to find a variable font you actually want to use. 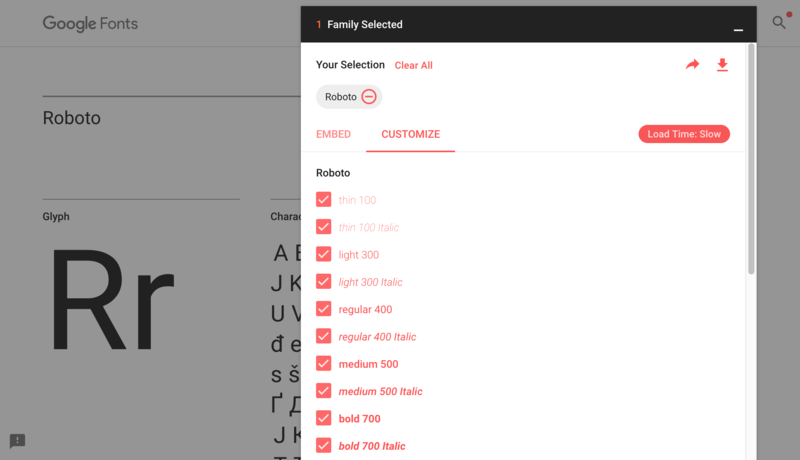 Google Fonts Early Access has three available, with many more likely to follow. Adobe is remaking some of the most well-known families (i.e. Minion, Myriad, Acumin) to be variable. The open source fonts Source Sans and Source Serif have also been released. Monotype, one of the world's largest typography companies, has so far introduced beta versions of Avenir Next and Kairos Sans. Some independent type foundries have also started to release variable typefaces. With variable font support now available in all major font-creation software, we can expect the availability to greatly expand over 2018. Once you’ve found your font, you need to use @font-face to include it on your site. We don’t want any browsers to download a font they can’t use. For that reason, we should specify the format inside the @font-face rule. Depending on the file type of your variable font, you can specify woff-variations, woff2-variations, opentype-variations or truetype-variations. As already mentioned, you should always use woff2. If the browser supports variable fonts, SourceSansVariable.woff2 and SourceSansVariable-italic.woff2 will be downloaded and used. 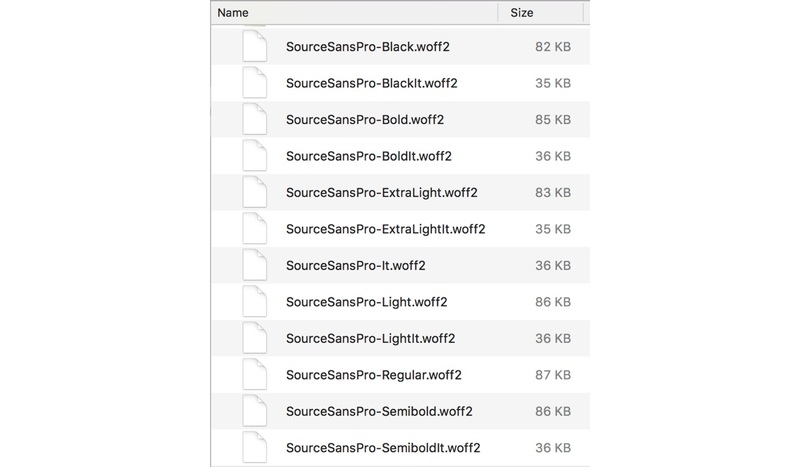 If not, SourceSans.woff2, SourceSans-bold.woff2 and SourceSans-italic.woff2 will be downloaded instead. The system-ui value is the new standard to access system fonts, while -apple-system is non-standardized syntax that works on Firefox. Traditionally, system fonts have not come in a wide range of weights or widths. Hopefully more will be made available as variable fonts, bringing all the benefits of variable fonts without a single HTTP request. Variable fonts have shipped in Chrome and Safari. They are already in the insider preview version of Edge and behind a flag in Firefox. At the current time, not all parts of the spec are fully implemented by Chrome. Using variable fonts in conjunction with font-style, font-stretch, font-weight and font-optical-sizing does not work in Chrome, so using font-variation-settings to control the five standard axes is necessary for the time being. Specifying the format as woff2-variations inside of @font-face also lacks support in Chrome (you can specify only woff2 and the font will still work, but then you are unable to have a non-variable woff2 fallback).